Ok, are you ready? I am. 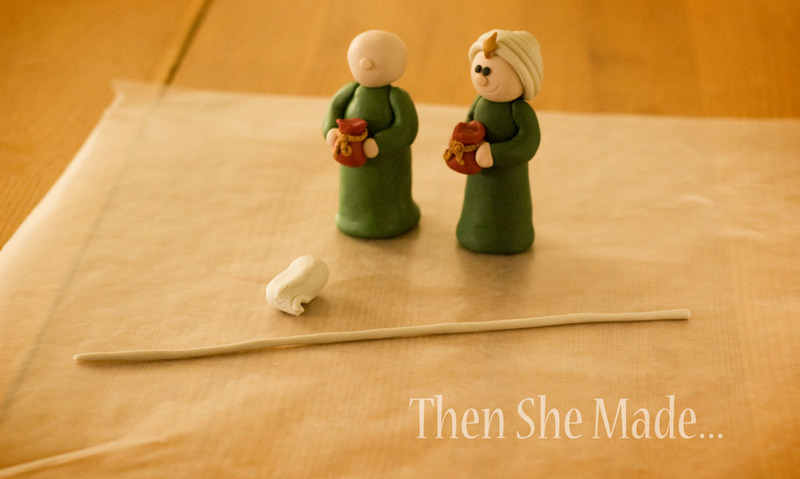 Here is the first of several tutorials for the clay nativity set. 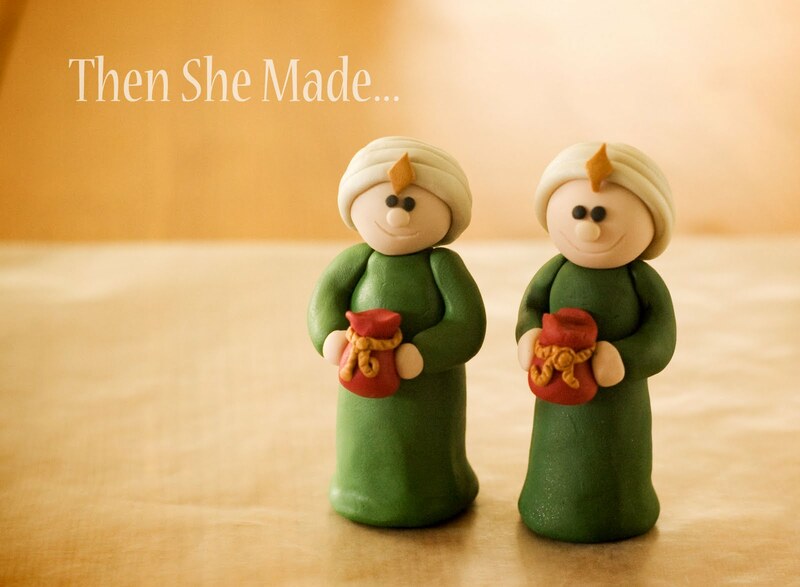 I'm starting with a Wiseman. Now, I must admit, the people in the set are all pretty much made the same. Same bodies, heads and arms so once you know how to make one, you can probably figure out the rest. However, the differences are in the details so I will still share each piece as a different tutorial. And, just to help visually, I've tried to keep a completed figure in each photo so you can see the progress as we build our little man. Hopefully that won't confuse anyone. 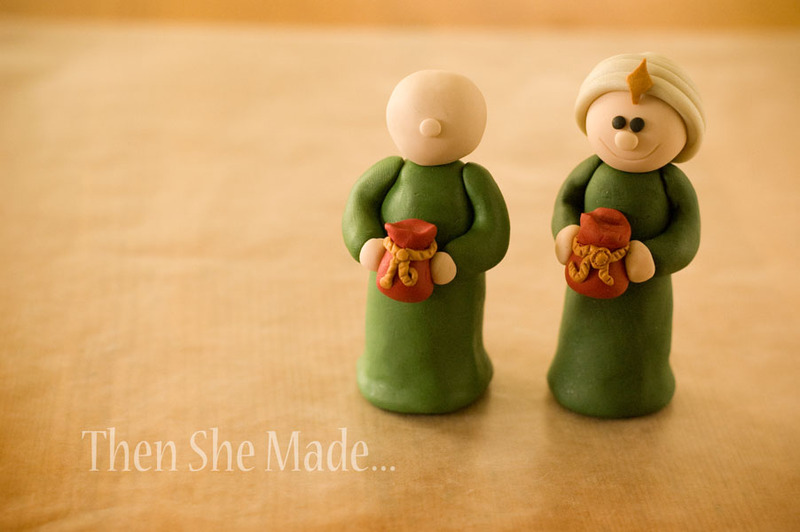 To start this project you will need to have a few things on hand, these items will be used for each piece of the Nativity Set that you make. - Clay: There are lots of brands out there. 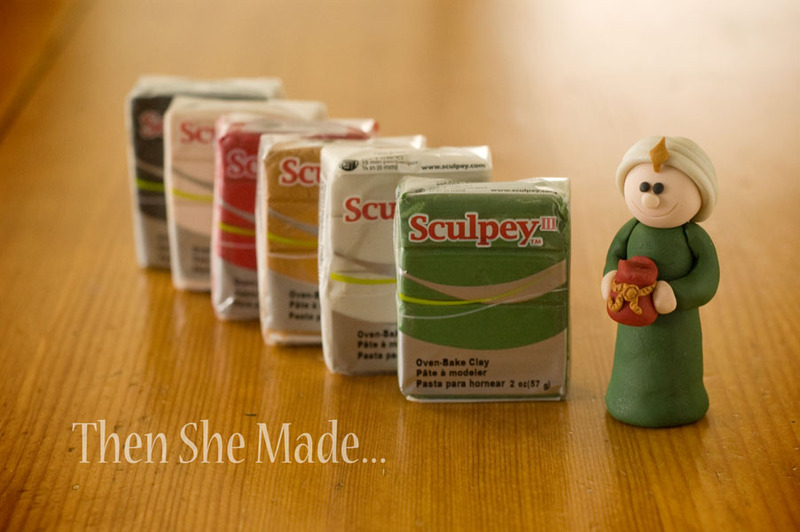 I prefer Sculpey but get the kind that you like. You will need, and want, lots of different colors. (specific clay colors for this guy are listed below) The price I pay for a square of Sculpey in Colorado is $1.99. I've seen it as high as $2.47. I always try and buy it while it is on sale. Hobby Lobby, this week (1/22-1/28) has all their clay on sale for 30%. Tip: When buying clay, lightly squish the package before you buy it. If it is rock hard, pass on it. You can buy clay softeners but honestly, it is just best to buy soft clay to begin with. - Wax Paper: Always, always, always cover your work surface with wax paper. Most oven bake clays are non toxic but it will leave a residue that is hard to clean. 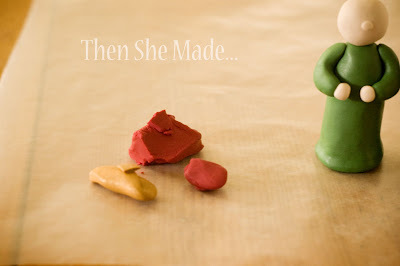 Wax paper will become your friend when you work with clay. And, change it often. Little fragments of clay can stick to it, so if you just worked with red and are now using white, if you don't change your paper, you'll get pink. - Aluminum Foil: I wanted to type Tin Foil but I realize they don't call it that anymore. Anyway, you will need it for each piece you make. - Oven: Sounds silly to have to mention that but we are working with oven-baked clay so you need an oven. That's just how it goes. - Baking sheet: If possible, dedicate one baking sheet for all your clay work. It is best not to cook or use clay on areas that you cook or prepare food, so having a cookie sheet for just clay is a good idea. Step 1: Gather the supplies listed above as well as these specific colors of clay. Step 2: Prepare your work surface by laying out a piece of wax paper. Step 3: Tear off a piece of foil then roll it up, crinkle it, and shape it so that you have a small round ball and also a longer thicker shape (see photo above). These are the forms for the head and the body of the Wiseman. I never measure but the body is roughly about 2.5 to 3 inches tall. Once you have them the shape you want, set them aside for a bit. Tip: You might wonder why I use foil. I do this for several reasons, it helps the clay cook more consistently. Clay cooks for about 15 mintues per 1/4 inch. If the whole figure was solid clay the cooking time would be forever and the outside of the figure would discolor and possibly burn. (trust me on this) Also, it helps keep the cost down. Making solid figures with clay would cost quite a bit more. Step 4: Take your clay (Leaf Green color) and break off a piece and condition it. "Condition" just means that you are going to knead it, squish it, and play with it until it gets workable and soft. If you have a pasta machine, you can dedicate it to clay usage and run your clay through the machine a few times. This will help you condition it as well. 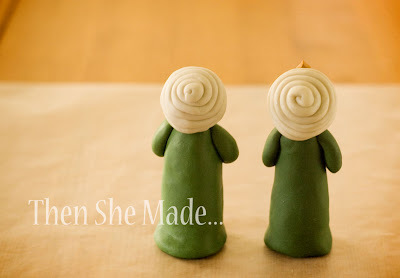 Once the clay is soft and workable, flatten it out like the photo above. Don't worry if it's not perfectly smooth, just try for a consistent thickness. Step 5: Next, take the foil form for the body and center it on your clay. 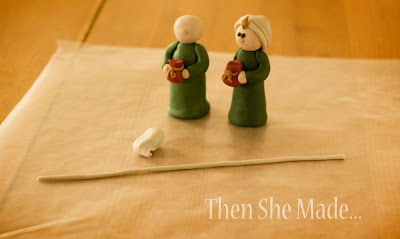 Then wrap the clay carefully around the foil like shown. Only wrap it until one end of the clay meets up with the other side. You can see in the photo above that I have more clay than I need. Don't keep rolling. If you do, you'll just waste clay and make your figure look, well, very plump. Step 6: As shown above, use a sharp tool and carefully remove any excess clay. 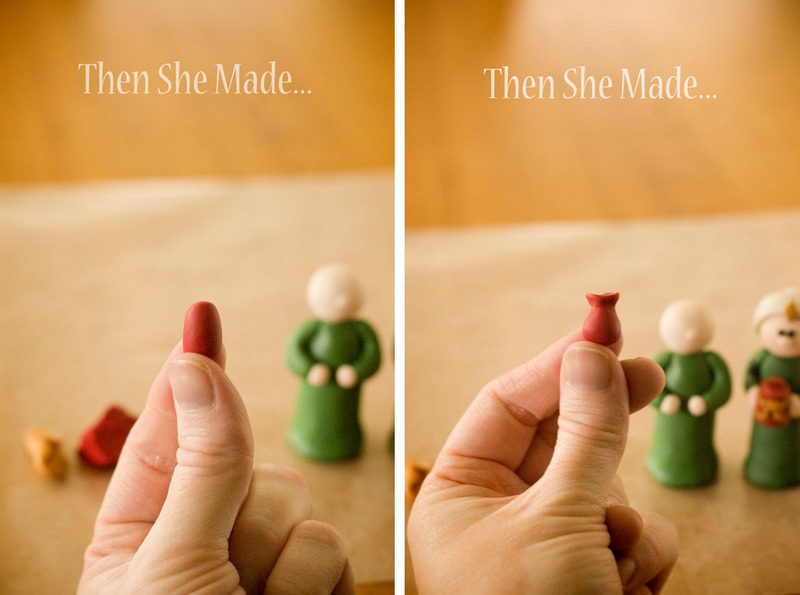 Then smoosh the edges of the clay together so you have something similar to what is shown in the second picture. At this point, you can see the seam. Step 7: Next, you need to merge and smooth out the seam so it's hidden. 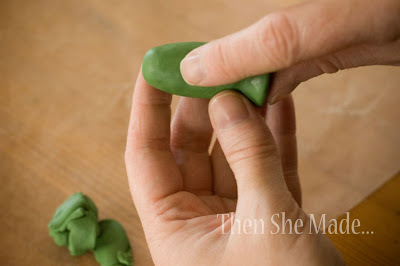 Do this by rubbing and pushing the clay into the other part with your finger and then just smooth out. Once it is fairly blended together, just run your figure down, always going in the same direction from top to bottom, around the whole piece. This will help smooth out any imperfections, bumps and even finger prints on the clay. Step 8: Now that the seam is hidden, you need to shape your clay. Try for something similar to what is shown above. You want to keep in mind that you need a wider, flat base at the bottom. If you don't have this, your figure will tip over easy. Step 9: Your body is now done but he is missing arms - poor guy! To make the arms, pinch off a small amount of the left over clay and shape into what kind of looks like a boomerang shape. See the photo above. Do this twice, he needs two arms. Step 10: Attach your arms to your body by lightly pressing each piece into the shoulder area of the body form. Don't press the rest of the arm in place yet, you need it keep it fairly loose so you can add your hands and gift. Set your body to the side for a minute, it's time to work on the head and hands. But, before you start GO WASH YOUR HANDS! Sorry to yell, just had to get your attention. Some of the clay colors tend to bleed and will discolor your hands. If you don't wash them before you switch colors then your next clay color will most likely pick up that color off of your hands. Trust me, I speak from experience! You don't want your man to have a green face. Step 11: Next, break off a small amount of Beige clay and condition it just like you did with the green. Make a small, flat circle and place the foil ball in the center. Step 12: Then, just like you did with the body, fold the clay around the foil and smooth it out to hide the seam. Be sure to pinch or cut off any extra clay. Step 13: Next, pinch off two small pieces and roll them, individually, into small balls. These will be the little man's hands. Step 14: Attach your hands and head to your body. You do this by lightly pressing the pieces together. You need to press hard enough to get them to stick together but you don't want to press too hard or you will squish it out of it's shape. Step 15: After your head is attached, roll a very small piece of beige clay into a tiny ball for the nose and attach it to your face - well, not your face but the figures face. Set him aside for a minute, now we are going to work on his little gift. Step 16: You will need your Deep Red Pearl and your Jewelry Gold clay colors. We'll start with the red. Pinch off a small amount of it and condition it. Step 17: Once it is conditioned, shape it into a small oval. Then, near the top of the oval, lightly press the clay inwards and shape the top to look like the photo above. Step 18: Next, take a small little piece of the gold clay, condition it, then roll it into a small rope. It really doesn't need to be very long, and you want to keep it thin so it's the right proportion for your bag. Then, carefully wrap it around the narrow part of your little red bag. See photo. After it's in place, you can take a tooth pick or your piercing tool, and using the side of it, press flat marks into the clay to make it look more like a rope. Step 19: Attach your little gift bag into the hands. Again, press it hard enough to make it stick, but light enough so that it doesn't squish out of shape. At this point, I press it into the body as well as into each hand. Then, lightly press the arms into the body and smooth down/out any finger prints. We're almost done, are you still with me? I know, there are lots of steps. Step 20: Pull out your Pearl clay, Pearl is the name of the color. Condition it just like you did with all the other clay, then roll it into a really long rope. Make it longer than you think you need. My first one, the one shown, was actually too short. Step 21: Next, take one end of the rope and press it carefully into the back of the head. Be sure not to flatten the face when you press. Then, carefully start wrapping the rope around the back of the head. Wrapping the outer edge first and work it into the center. It will form a spiral as you wrap. When you reach the center, pinch off any excess clay and smooth out the tip by pressing it into the center of the spiral. You should have something like what is shown above when you are done. Step 22: Next, roll two small, tiny little balls out of black clay and attach your eyes. 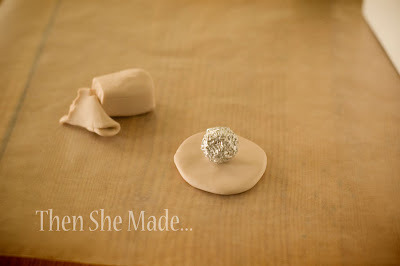 Step 23: Using the Jewelry Gold clay, shape a small diamond and press it into the center of the hat. Step 24: Using your sharp piercing tool or tooth pick, carefully draw in a smile. Step 25: Preheat your oven to 275 degrees. Place your little man on a cookie sheet and bake for 15 minutes. Do NOT over cook or he will turn brown, trust me on this. Also, I always line my cookie sheet with a piece of paper, just printer paper, before I put my uncooked clay on it. This keeps the residue from your pan and will also help so you don't bleed colors with other projects. And, just a reminder, it's a good idea to dedicate one cookie sheet to be used for clay only. You don't want to cook food on something that you've cooked clay on. Step 26: Let the little guy cool and then admire your work. Congrats! You're done with your first piece - only 11 more to go! Email me if you are stumped or have questions! I am so excited to try this! Thank you so much for sharing. I do have a question - I will need to order the clay online because it isn't sold locally. Is there any chance you could share the colors we will need for all 12 figures so I can place one order and save on shipping? I know I am asking a lot, so if you don't have time I completely understand. Thanks again! The use of the tin foil (I still call it that) is absolutely brilliant! Your tutorial is so detailed. I love it! Thank you. Amy, can I just say, I love you! I found your blog in the fall, I don't remember how, a link of a link of a link, probably. I get so excited when I see an email notification that you have a new post up. Your tutorials are great and all of your projects are wonderful. Reading along and looking at the pictures, it feels like I could be sitting with a friend, watching and learning and laughing. You're great, thanks for putting this together. God Bless! Just found your blog. Looks like I'm just in time to start this darling nativity. I love to collect nativities, so this is perfect. Your tutorial looks very good and easy to follow. Thank you soooo much for sharing this! I am so excited to get started on this!! Thank you for putting up a tutorial! I love these! Such a great idea!! I am going to start now! Thanks for doing this. The kindness of strangers really makes the world a better place! 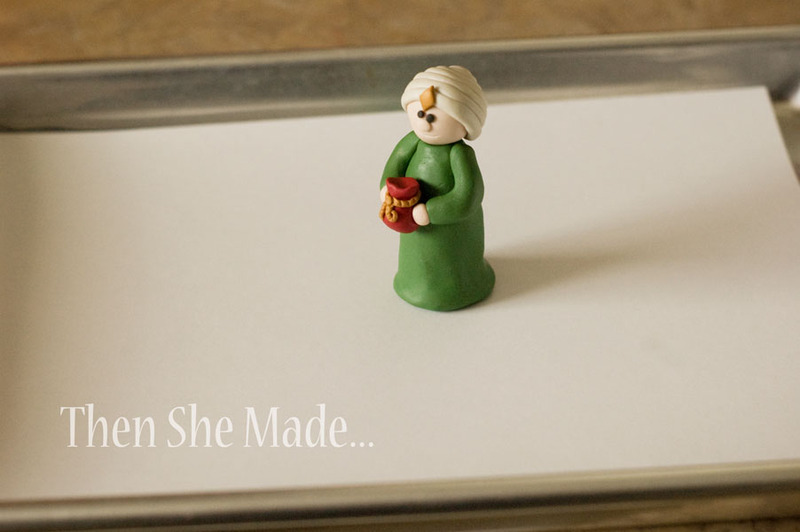 I had a very enjoyable time making Mary, which is where I started my set. Thank you for sharing this tutorial. It is generous of you. How kid-proof are the figures? 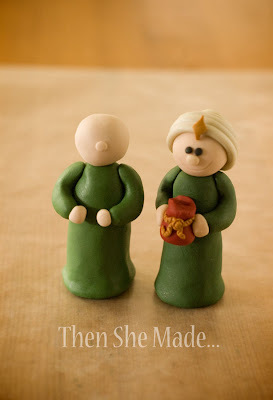 I'm looking to make a nativity that my 2 and 4 year olds can play with. This one is by far the cutest that I've found! Thank you so very much for sharing your tutorials with craft-challenged people like me! 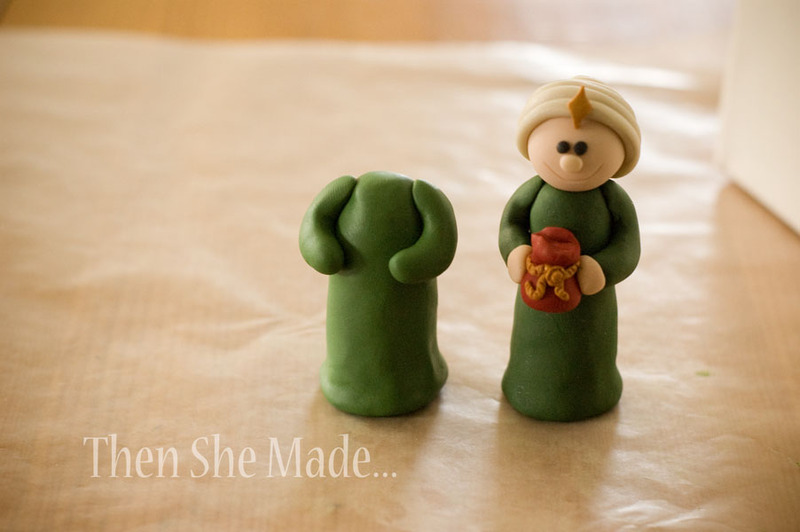 :) I made the entire nativity set for my brother and nephew for Christmas, and everyone thought it was adorable! Thank you! Thank you! Making things with clay. Love, love,love, nativitys. I wish I had found this sooner but I have found it now and I am going to follow your tutorial and make the whole set for me and others. I love your ideas and I'm so excited to do this! Thank you so, so much! Knee Deep In the Hoopla! It's a New Year!!! Wanna win something?? ?